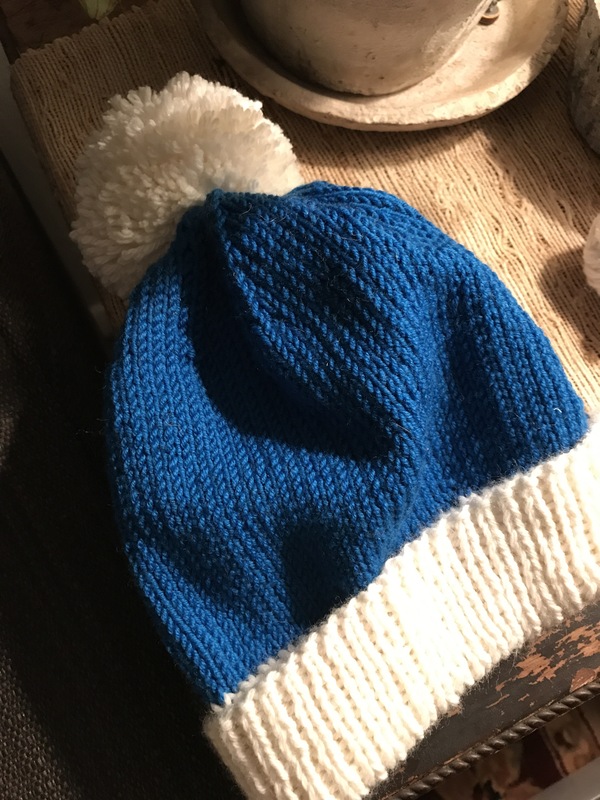 I was delivering a hat I had knit for my son to a friend of mine as it was a bit big for Ethan, but would fit her little guy better. She actually does my hair and is the owner of the salon I go to, and was generous enough to take $20 off my bill for the hat. 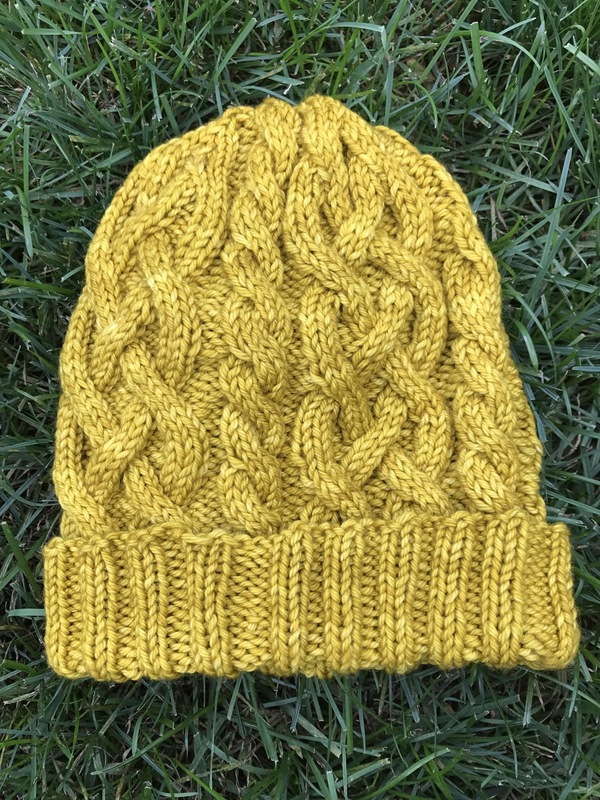 It was really my first piece of knitting I’ve ever sold (!). While we were talking at a coffee shop a friend of hers came over to say hi. It turns out he’s another small business owner locally. 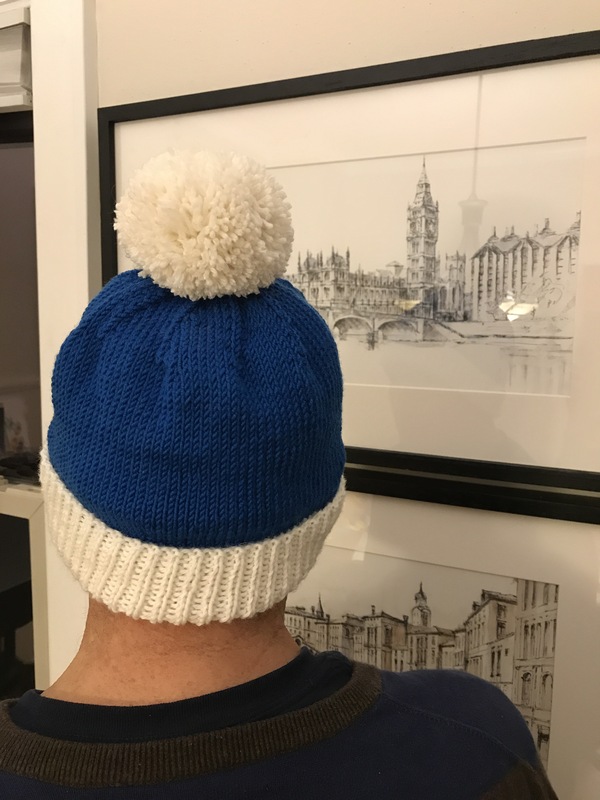 He commented on the hat and once she told him I had knit it, he got all animated and asked if I could knit a bigger one. All you knitters out there know what I was thinking, umm yea…of course 😌. But I just said yes, an adult size isn’t hard at all. He said he can never find a hat that covers his ears for some reason. And to that, I was thinking maybe instead of a 9 inch length he might just need 10 inches and a folded brim so he can customize it. It turns out once I looked at what I had in my stash once I got home there was some white Berroco Vintage so I used size 6 needles and did a four inch brim. I feel like this yarn is more aran than worsted as the guage is significantly bigger than the worsted merino on size 7 needles. Anyhoo. Here it is finished, modeled by my husband. Plenty big. Happy with the results. Now this guy is really a complete stranger so it was very awkward when we were figuring out when to meet and he asked how much for the hat. 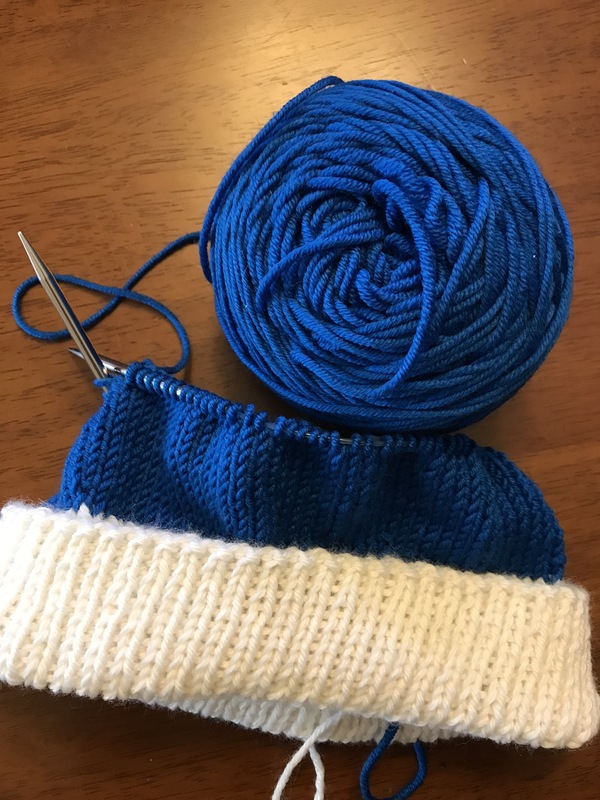 I had a $16 investment in the blue yarn and a few hours at least in knitting. I had gotten $20 for the kids hat so I said $25-30 but no pressure. He gave me $30 which was generous, but then when I stepped back and thought about it I’m sure that was at least double what he was originally thinking when he first asked for the hat. I was able to return the Cascade, so I made $14. Set the price ahead of time and explain the cost of the yarn (especially with strangers). I won’t make much of a profit without using cheaper, synthetic yarns or buy wholesale. 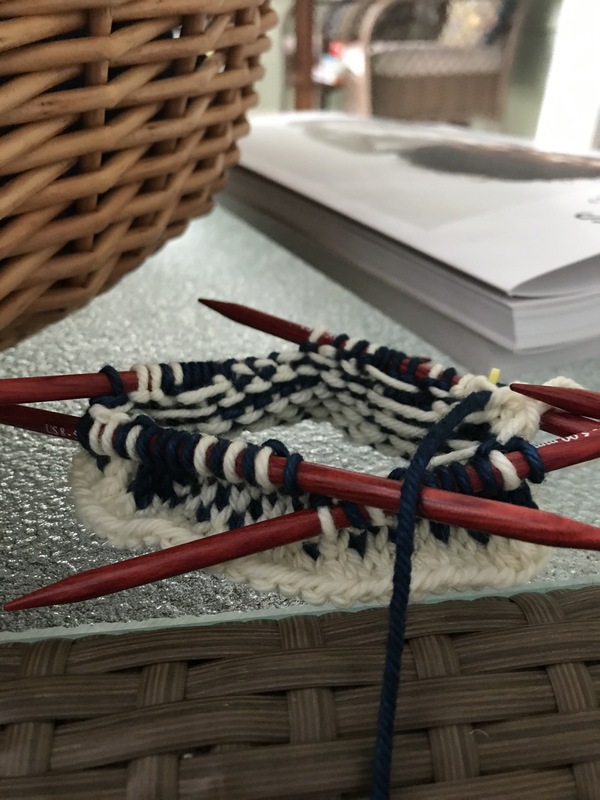 Knitting is really something to do as a gift of a part of myself to someone and being compensated for my time knitting is nearly impossible. 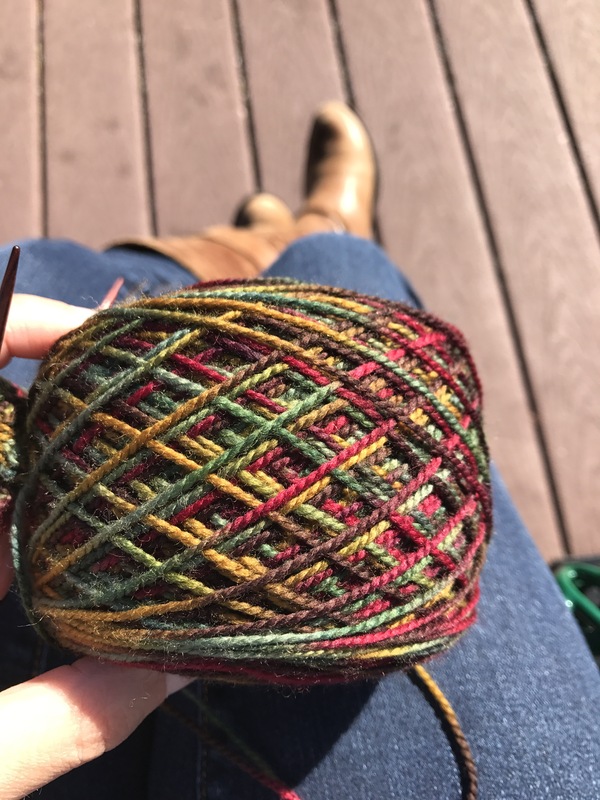 This ball of Plymouth Happy Feet 100 yarn is perfect for the season. 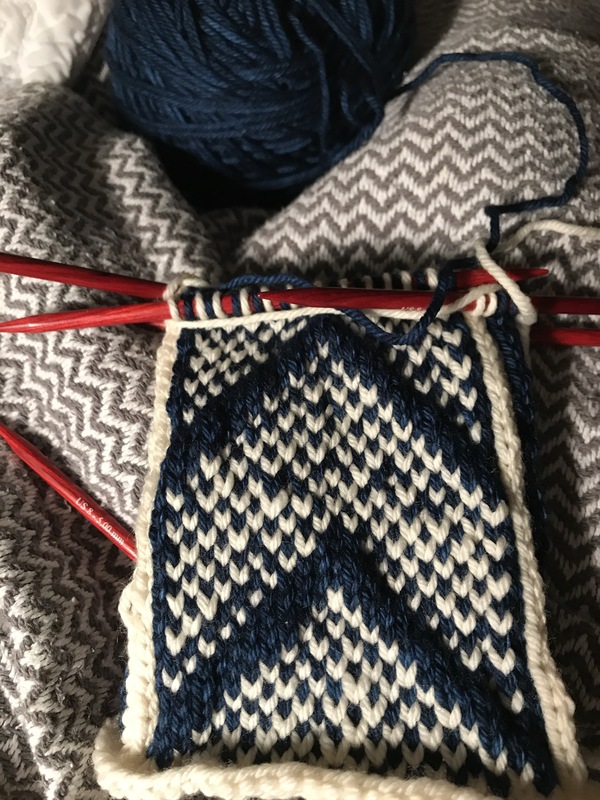 I’m knitting myself a pair of socks with a really basic sock pattern from Churchmouse. 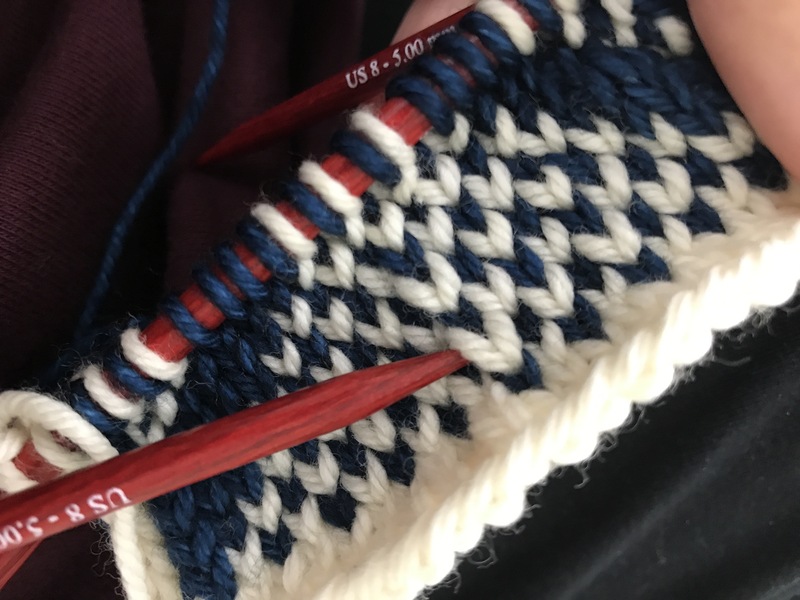 I’m just going to do plain stockinette stitch as I feel like cables or lace would get lost in the dark variegated colors. 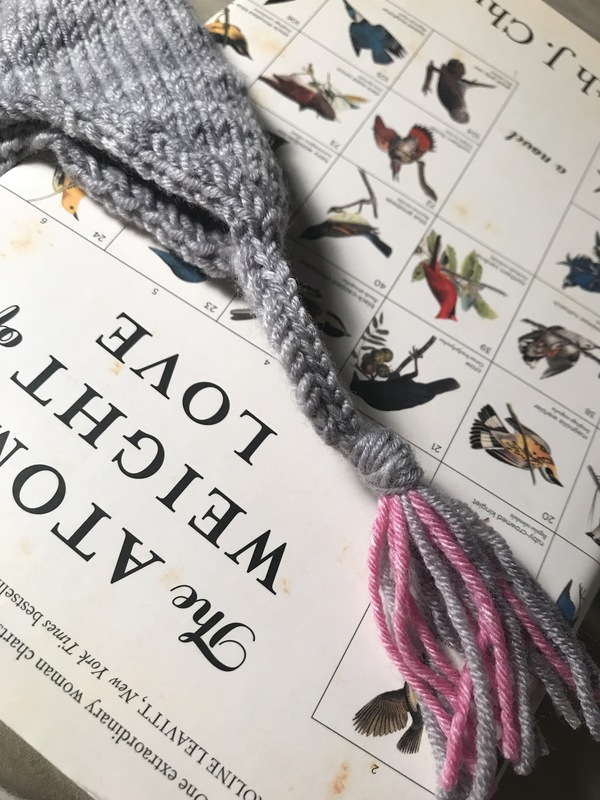 I recently completed the Traveling Cable Hat by Purl Soho. This is a free pattern from their website and the first PS patten I’ve done. I felt like the instructions were really clear and I was very excited to use this Frank Ochre colorway from Malabrigo Rios Yarn. I used size US6 circular needles for the rib and US7 Addi circular needles for the main cable pattern. I felt like this was a really great cable project because it has two different cables, a wide Celtic looking one and a narrow twist one which look really complicated, but they’re not 😅. Very tedious, and not something I could do around a lot of distractions at first. Another slight modification I did was only repeated the pattern 3 times total instead of 4 as it was written. 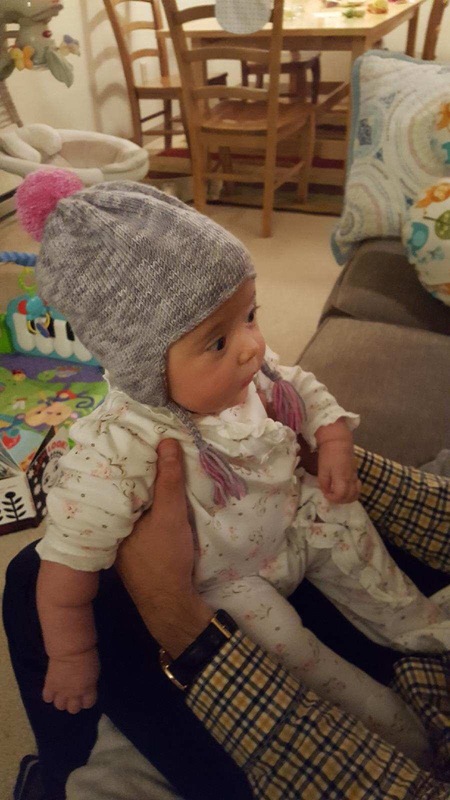 I wanted a more snug beanie than a slouchy one. Size turned out perfectly and I haven’t blocked it yet but have worn it a couple times. For me it was fun to briefly focus on cabling but I’m good for a while now! I would do this again for a gift for someone else as it does look pretty intricate and impressive 🤗. Meg Swanson & Clara Parkes! 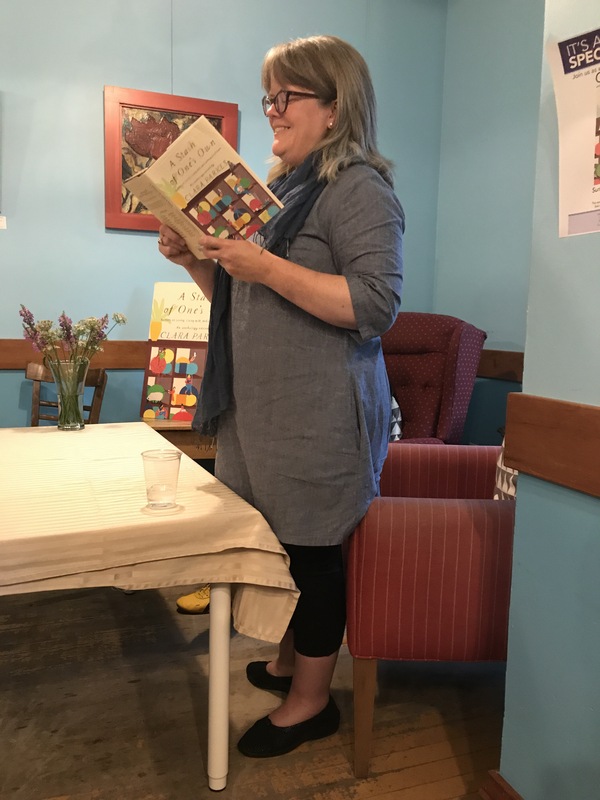 A few weeks ago I got an email from the Sow’s Ear knitting cafe that they were having a special evening with Clara Parkes and Meg Swanson for a book release, reading and signing for Clara’s latest book A Stash of One’s Own. 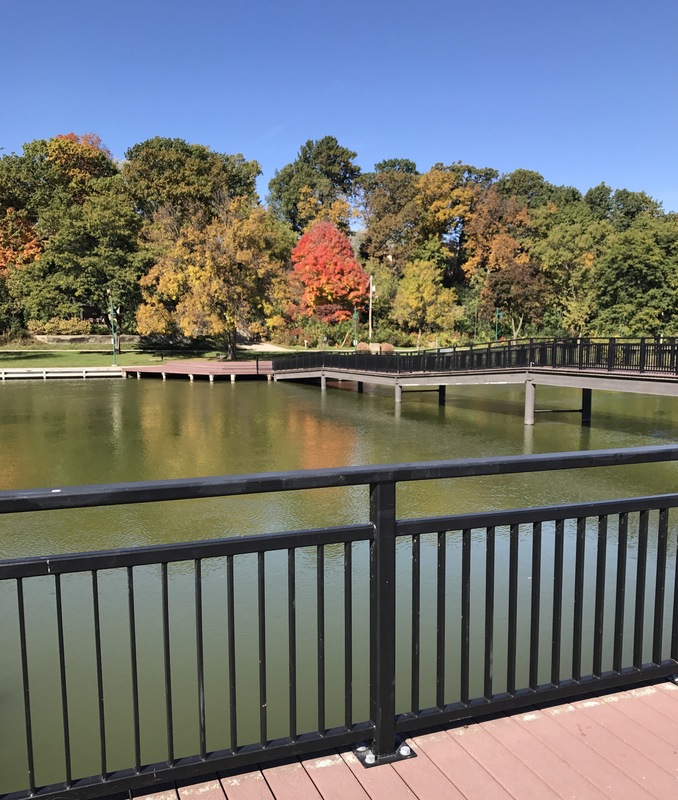 This is about two hours from where I live, but it’s Madison and it’s a cool place to visit so we made arrangements for our two older daughters to stay with my parents and took our little guy Ethan with us. He was the perfect travel companion along with my supportive and awesome husband. 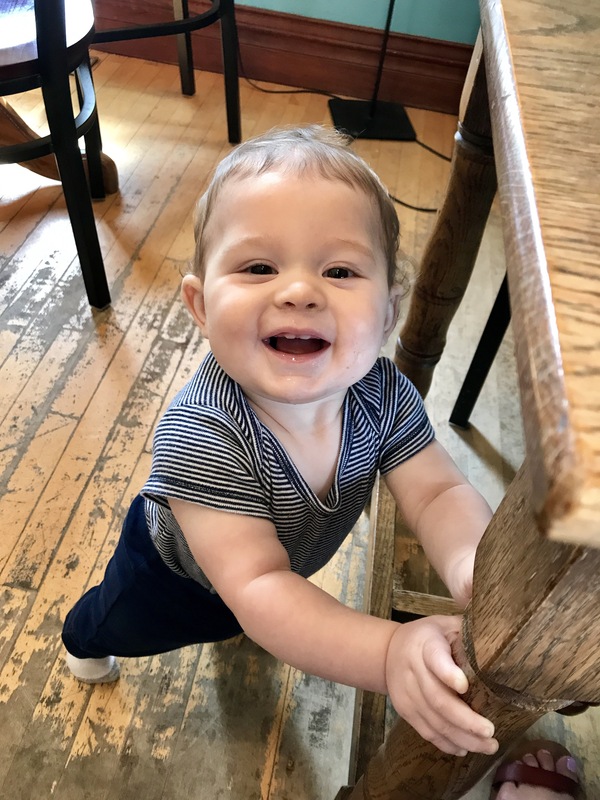 Here he is at the cafe. I attended the event by myself and didn’t know what to expect. That being said, everything about it was perfection. 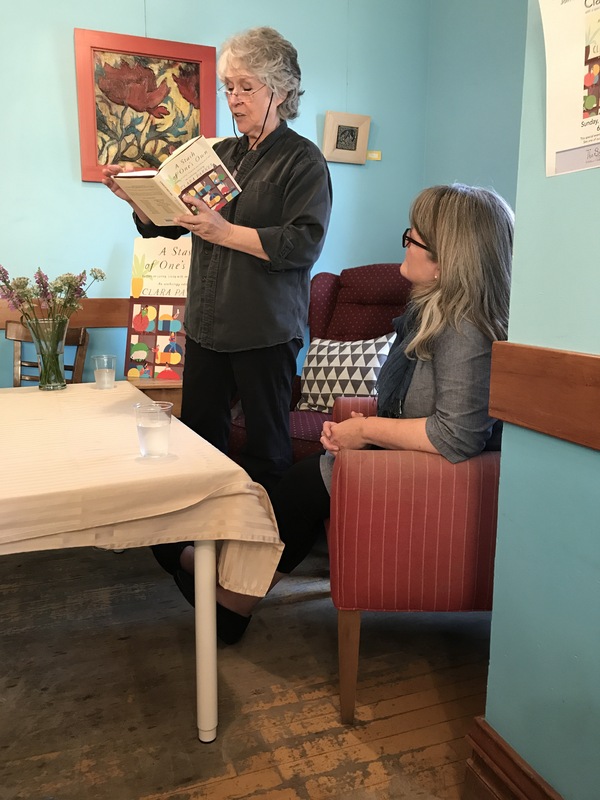 I got my book signed by both, chatted briefly, bought a skein of yarn that made me think of my daughter, Lily then went back to the hotel and crashed. It was worth the drive and my heart was full. I’ve been working the same job for five years. A part of me loves it and a part of me has changed passions. When I first started working here (we’ll leave the where private) I had an adorable 18 month old toddler, Lily, and was a single mom trying to stay true to my passion of helping people and supporting my tiny family. A couple years later I was married and had Evynne (pronounced Evan, Evie for short), and 22 months after she arrived, Ethan was born. My life is fuller and busier and more amazing than I ever thought it could be. 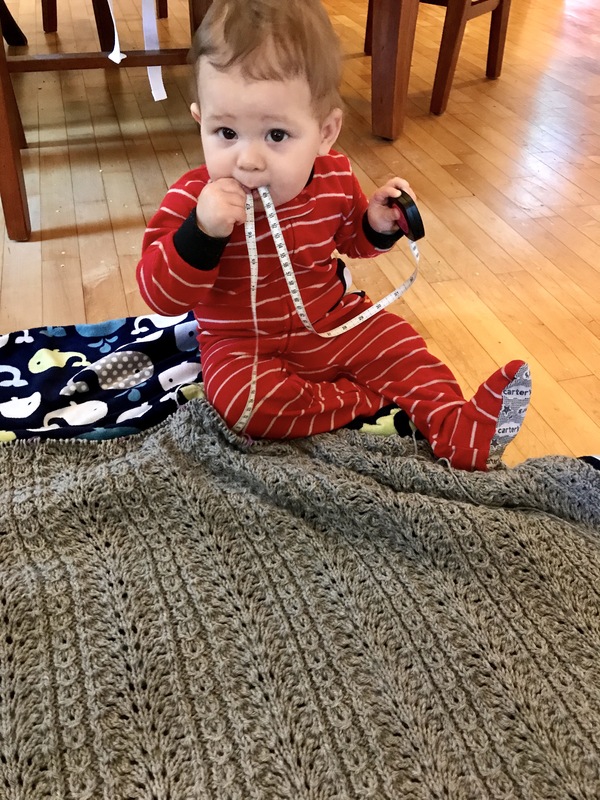 I started knitting when I was pregnant with Evie and although I was super confused and clumsy at first, I had this image of myself being a “knitter” and I was hooked on the beauty of wool and needles in my hands. 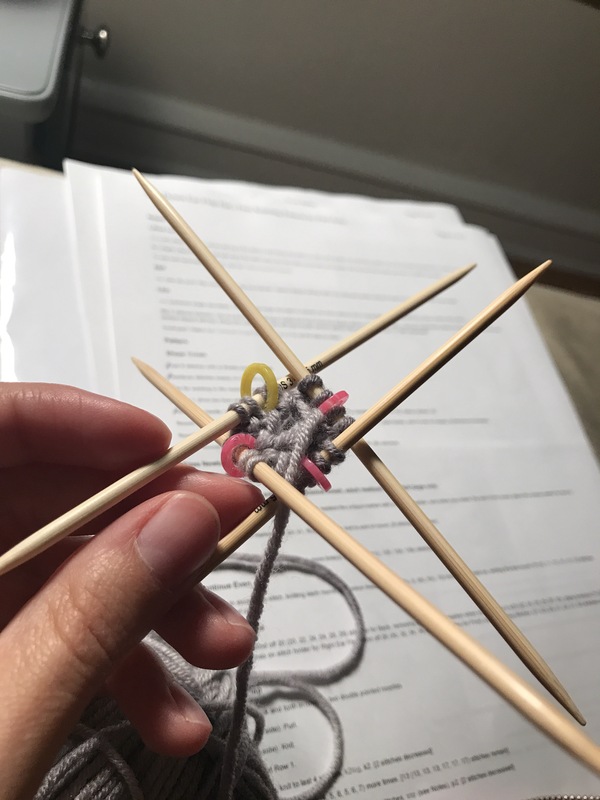 I got into graduate school while pregnant with Ethan and absolutely loved the one class I took, but decided I could not work fulltime, have three kids, a husband and so many other interests (knitting!) and function properly. As an introvert I require quite a bit of downtime to recharge after working with people and then my kids all day, and I decided to shelf the master’s program indefinitely. It was a couple of months ago when I had an honest moment with myself. What would my “dream job” be? What kind of work could I do that spoke to me and brought me to life? At my core it all made sense when I let myself dream of owning a knitting shop. 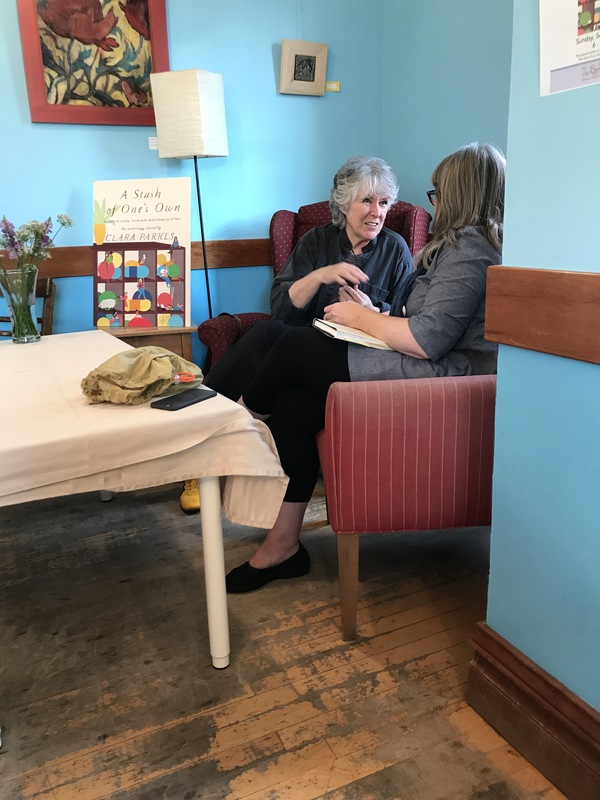 Some place with creaky hardwood floors, exposed brick walls, potted plants and gorgeous displays of yarn wall to wall … and a giant wooden work table for classes and events. Ever since that day of my dream taking form in my mind, my knitting has so much more purpose. I feel like I know who I am and where I am going. Even if I never actually have the keys to my own yarn store, the dream itself has made me feel more grounded and whole. 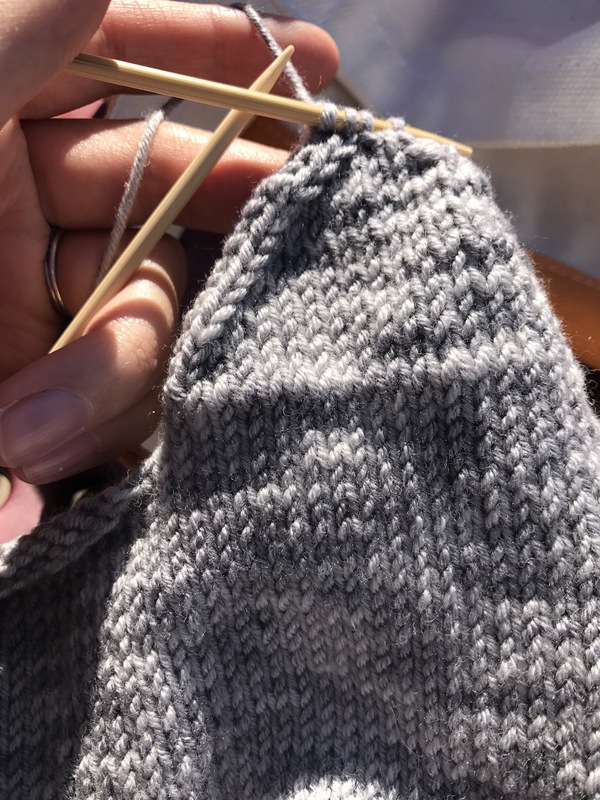 I know I need to work on technical aspects of knitting and push my knowledge and skills, but all of that is a labor of pure love. I feel privileged and blessed every time I pick up my needles and work on a project. 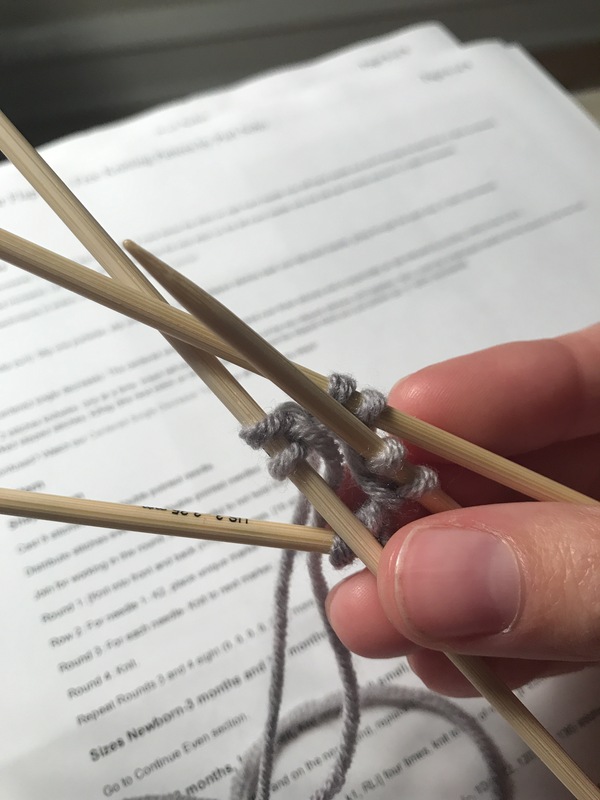 I feel like I have also become more of a “student” of this craft and have immersed myself in books (both hard copy and Audible) about knitting, sheep, alpacas, dyeing and spinning yarn, etc. 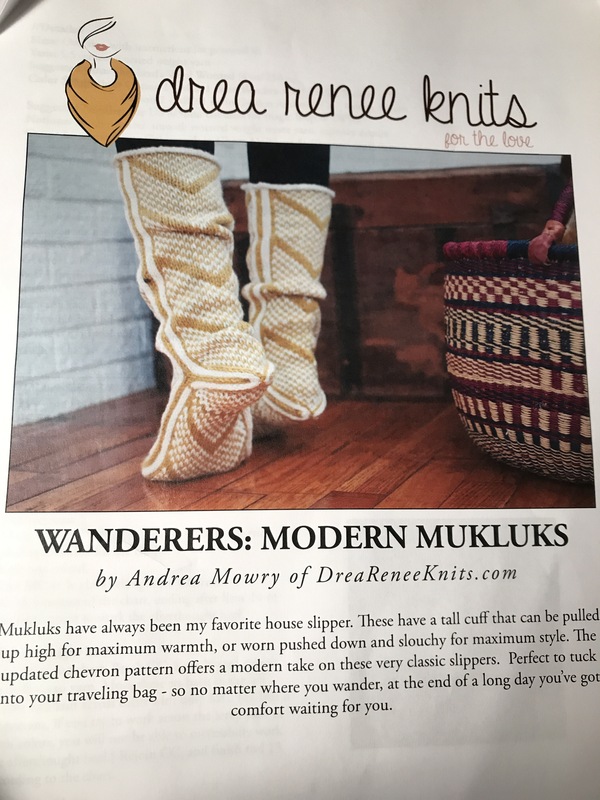 I created a knitting-only gmail account to sign up for newsletters from knitting designers, writers and teachers and it seems like every day my eyes are opened a little wider to this fantastic, gorgeous world of knitting. Similar to how it felt when I met my husband, Chris, and had my three kids, I feel home. 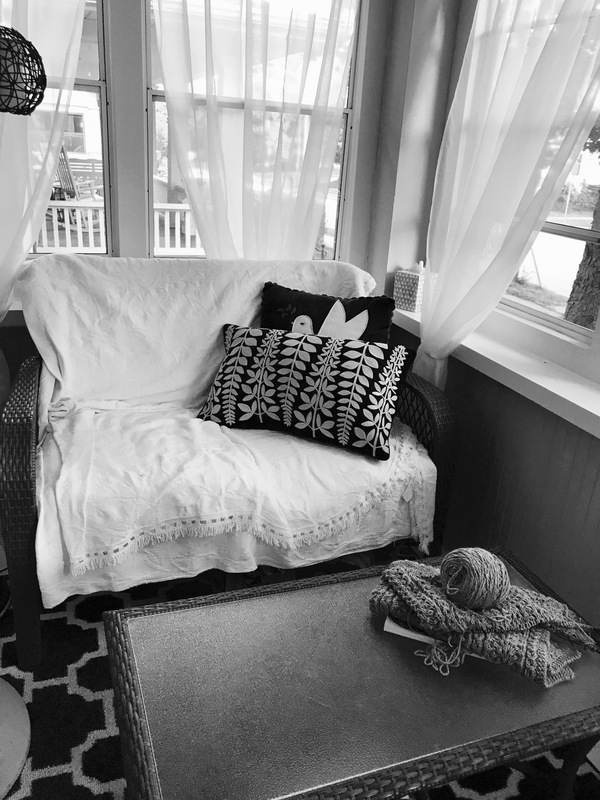 Here is one of my favorite places to sit and knit, our screened in front porch. Apparently I have very little self control when it comes to keeping my kids’ (and other people’s kids) heads warm for the fall and winter. 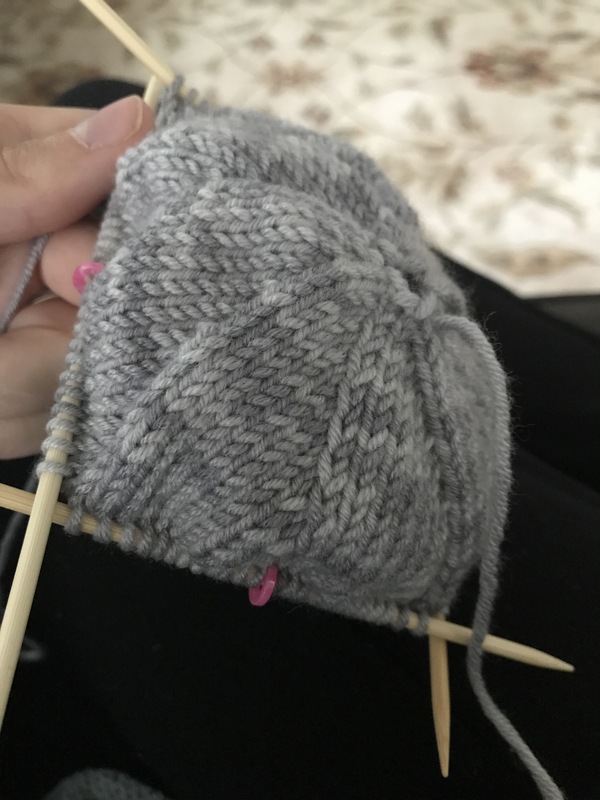 Right when I declared this would be a time of knitting for myself, already, the evening and early morning temperatures have dropped to the 40’s and I have begun my 9 month old son’s hat. 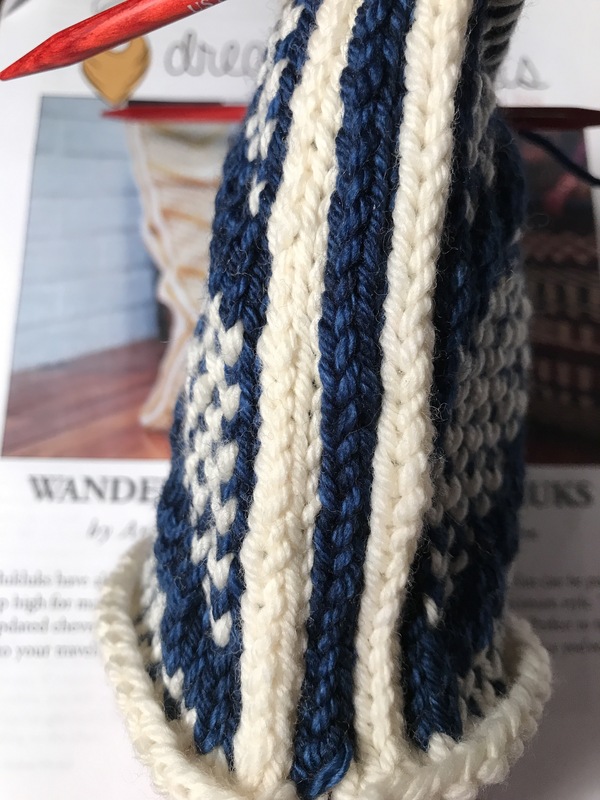 I decided on a beautiful, almost electric color blue with a heathery grey to stripe his hat. 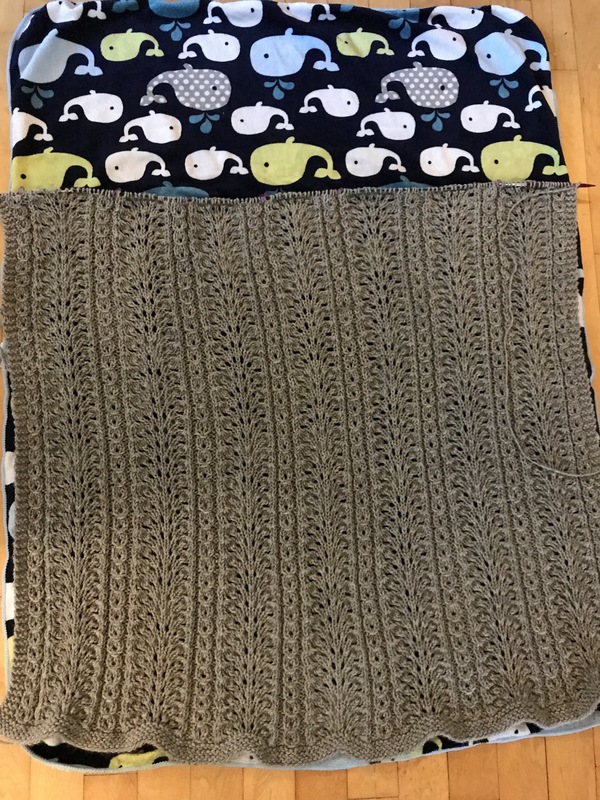 My son Ethan’s buddy Phineas has his first birthday coming up…so it only makes sense to knit Phineas the opposite color variation so the two can match. And yes, this should use up two skeins of yarn perfectly 🤓. I decided on a long brim to fold over to keep their ears especially warm. I’ve folded it a few times to make sure I have the right length. 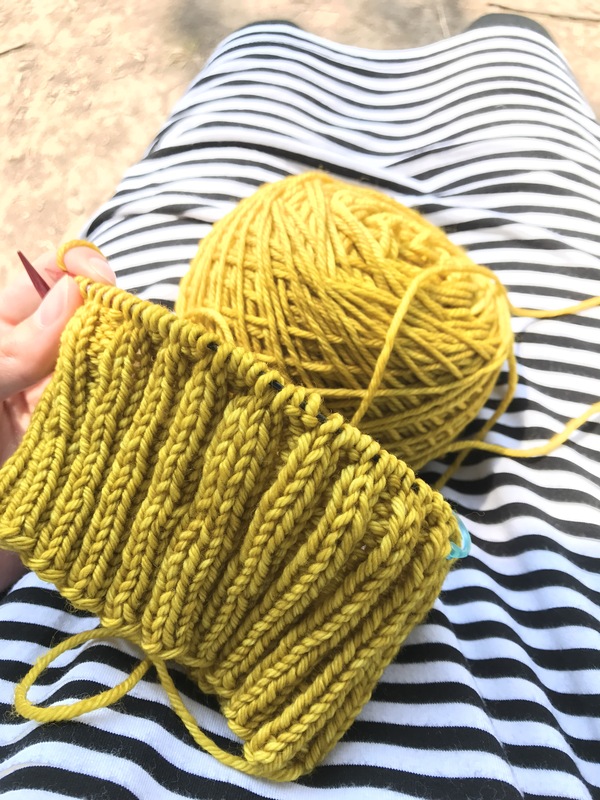 I refreshed my memory with how to achieve stripes in the round without jogs and though I tried something new with this approach, I went back to the trusty: knit round with new color and lift the stitch below purlwise, then knit two together on the second round (shown here). 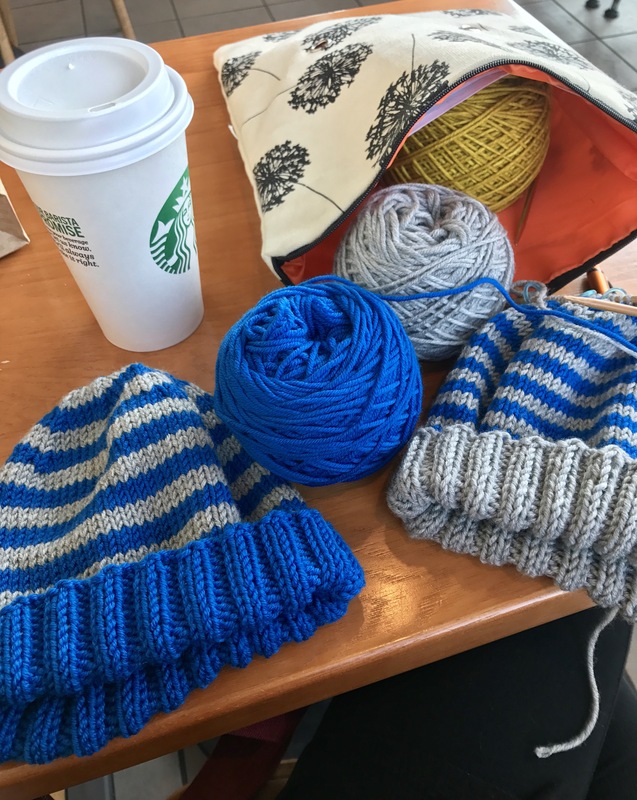 If it looks like I live a life of luxury knitting at Starbucks, you’ve been deceived 😂. I got to a meeting early so I spent it going around and around on Phin’s hat. I should be able to finish it tonight once the kids are in bed. Then make the pom poms, attach in time for the birthday party this Saturday (it’s now Wednesday as I write this so I’m making great time). I’ve made pom poms with scrap cardboard and they turned out fine. I did want to try this Clover pom pom maker just to compare methods. I have to admit – the Clover method was straightforward, easy and made a big, thick ball. I will be using this for all hats going forward. 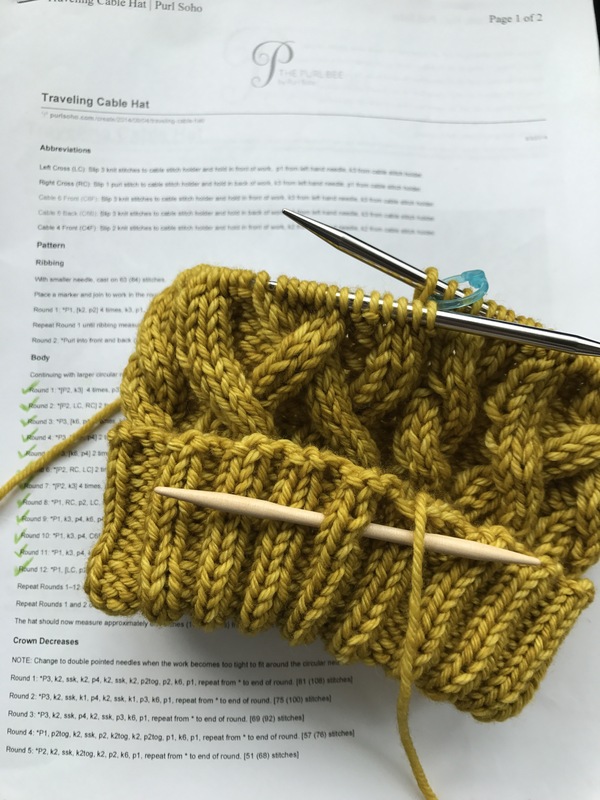 Did you happen to get a glimpse of that gorgeous mustardy yellow Malabrigo yarn in my bag? 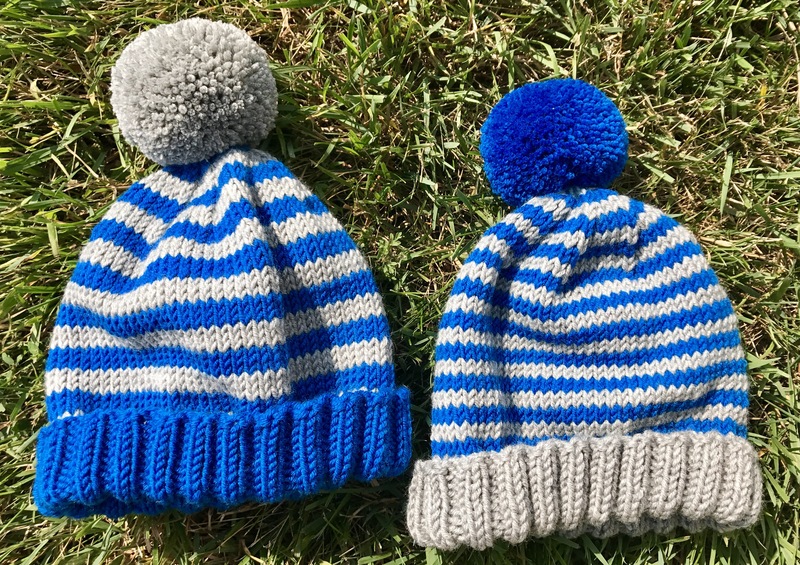 Here’s the thing – I promised myself after knitting these hats for the boys I will knit a hat for MYSELF. I am SO excited about that!!! More to come in another hat post on that project soon. Here’s a quick pic of the finished product. 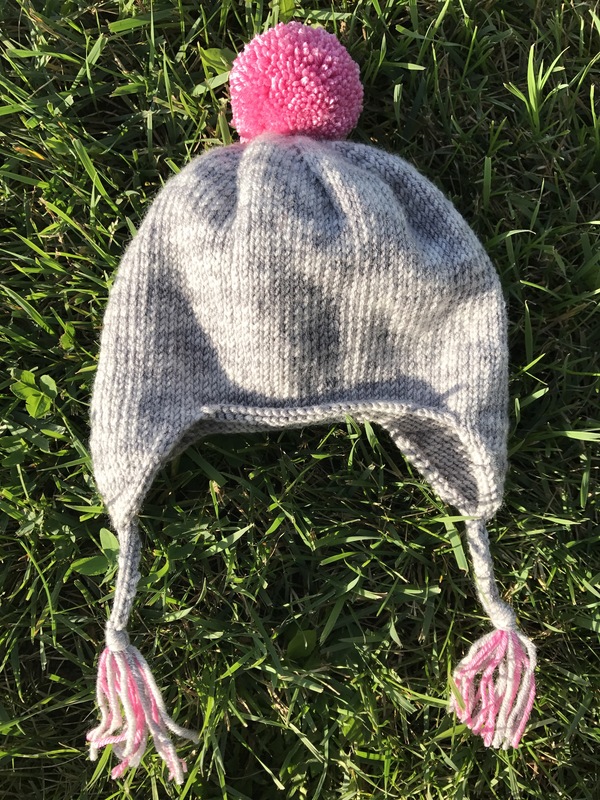 I’m not nuts about the blue pom pom and I think I have enough yarn to redo it – that one will go to my little guy 😉. Hopefully I’ll add a photo of the two of them wearing them sometime soon! 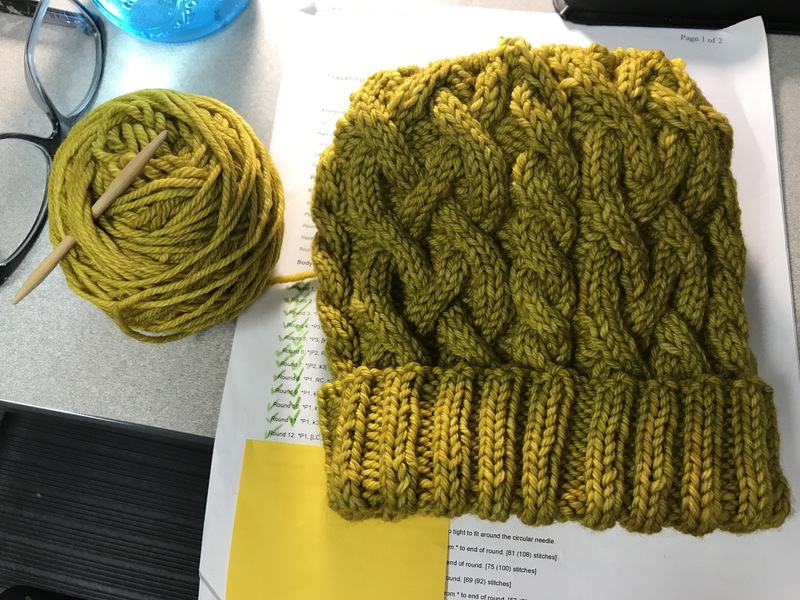 Project details: basic hat pattern with ten decreases at the crown. 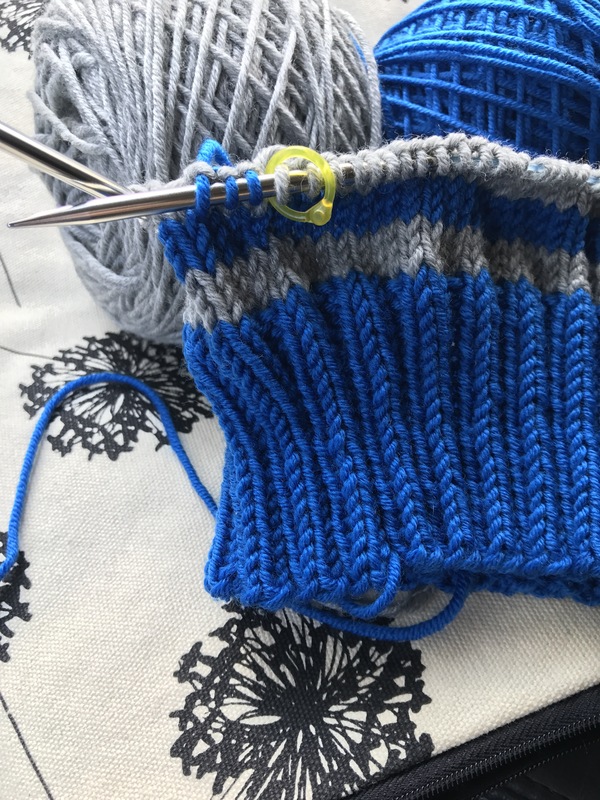 I used size 7 needles and Plymouth Select Worsted Merino Superwash in colors 49 blue and 7 light grey, click here for other color ideas. 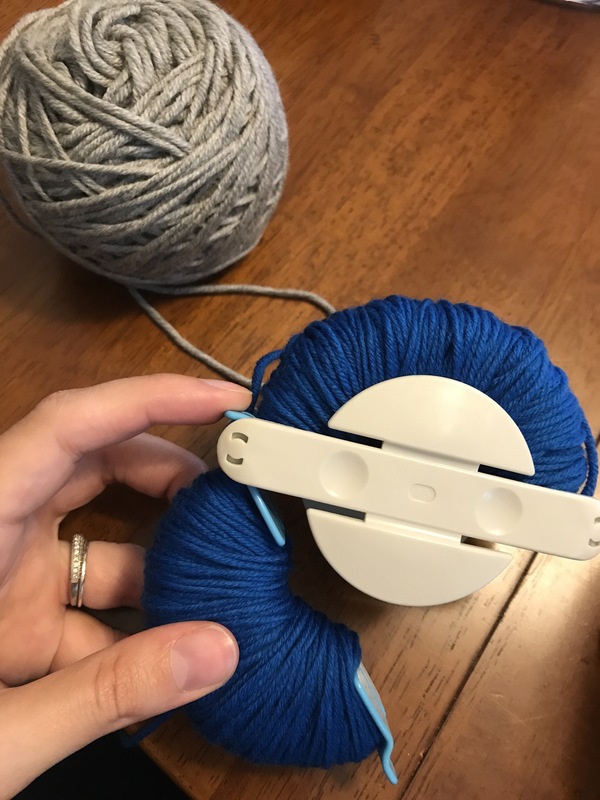 I would definitely use this yarn again. Now time for my hat 😁!!! !